I’ve alway loved this quote, and I love it even more after a quick Google search attributes this nugget of wisdom (with slight re-wordings) to Coco Chanel, Benjamin Franklin, and Albert Einstein. If their contemporaries were convinced that each of these outstanding individuals had conceived this expression on their own, then it indeed rings true -- at least two of them were hiding their source(s). Of course, there’s always the less romantic notion that each one did indeed assert the above belief independently of the others -- after all, can’t two different people (or three) have the same great idea? -- but we’ll sweep that aside for now as we ponder another example. 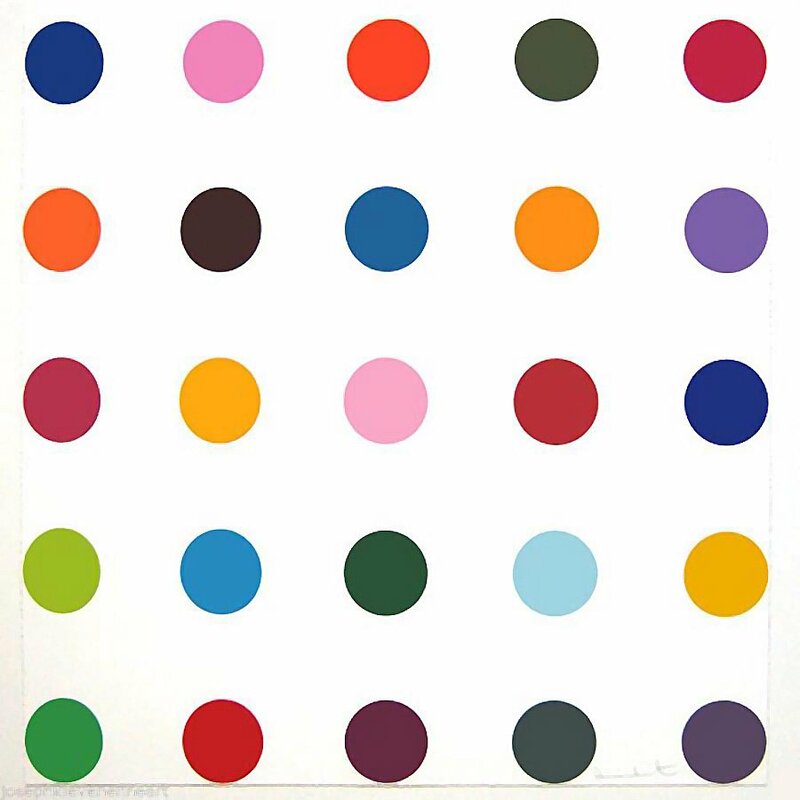 Take a look at this spot painting from Damien Hirst. From 1986 to 2011, Hirst produced over 1000 spot paintings, most of which he never painted himself (having assistants create your work is a topic for another separate blog entry altogether). When I first saw these paintings, I loved their simplicity -- they really seemed like nothing more than pure celebration of color. It was the closest thing I’d seen in the highbrow world of fine art to what could be called ‘eye candy’. It kinda had me wondering why no one had tried doing this before . . . or had they? 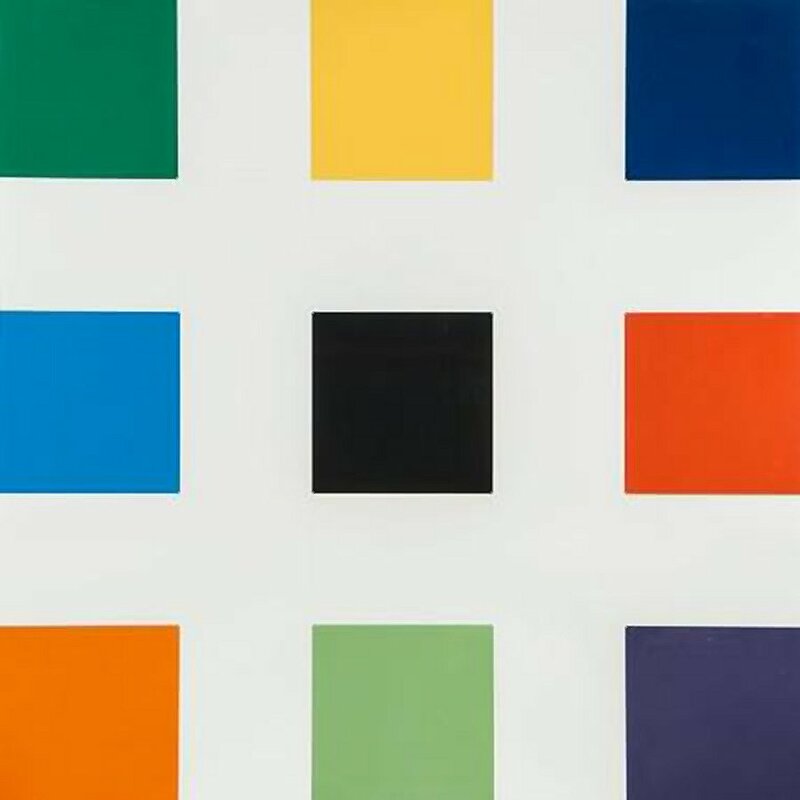 Here is a print from American artist Ellsworth Kelly from 1976 called Nine Squares. It, too, appears to be an organized grid of random color on a light (white) background. Is it possible Hirst saw this image during a survey of Pop Art while studying at University of London in the late 80s? Entirely. No study of modern art would be complete without at least an introduction to Kelly’s work. Now take a look at the next image. 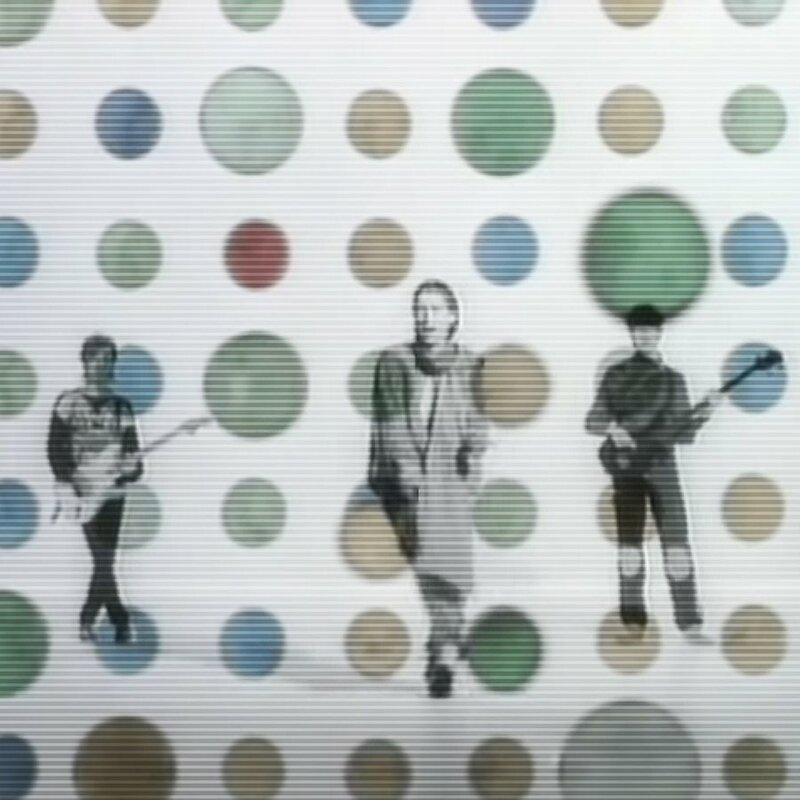 Here’s a still frame from The Psychedelic Furs’ 1984 video for the track “The Ghost in You”. The grid layout for the smaller spots is virtually identical to Hirst’s spot paintings. Could young Damien have seen this video while a student at Jacob Cramer School of Art in the mid 80s? Absolutely. The fact is, we will never know to what extent these images influenced Hirst, if at all. He himself may not even know, as he may have casually seen them in some fleeting moment, and relegated them to his subconscious, only to have them bubble back up to the surface (knowingly or unknowingly) during a creative spree. One of the jobs of artists, after all, is to observe the world around them, and to reflect those observations back to the viewer in a stimulating, thought-provoking manner. I find Hirst’s spot paintings to be stimulating, regardless of where their inspiration may lie. The world of decorative art has traditionally borrowed rather unashamedly from the latest trends in the fine art world. And honestly, does anybody ‘own’ the idea of arranging random color in a grid-like pattern? The grid itself dates back to antiquity and originated in multiple cultures, often as a means of laying out a city. So what’s to be made of all this? Is Hirst a copycat or a genius or both? I would suggest that as an artist today, especially in the age of the internet, the struggle to be original is more challenging than ever. We are bombarded with so much imagery from so many types of media, it’s often hard to tell the difference between an original thought and a recollection from the subconscious. And every time I think I’ve come up with a fantastic art idea, a quick internet search reveals that many others have already thought of it before me. But have they executed it exactly the way I would have? Is there nothing unique that I would bring to idea? Should I let this stop me from pressing onward, even if my work feels derivative? I would say no. There is always something new an artist can bring to the visual exploration of an already established concept or idea -- if the work does not feel new enough, then the artist must push harder to find the thing that gives it a voice all its own. As long as an idea is executed with integrity and a commitment to one’s own sensibilities, some level of originality is inevitable. Keep at it. Do not stop. Use your influences. Do research. Never stop seeing. Let the work of those you admire be an inspiration. Do not worry about having your work labelled as derivative, just keep moving forward and something new will emerge. And never feel like you have to reveal your sources. It feels appropriate to close with another famous quote, this one attributed to T.S. Eliot, Igor Stravinsky, and Pablo Picasso, but I’d like to take it and build upon it to make it my own (see what I’m doing here?). And you can quote me (or Thomas Edison) on that.